Chelsea’s France midfielder Tiemoue Bakayoko has signed for Italian club AC Milan on a season-long loan. The 23-year-old, who played once for his country in 2017, made 43 appearances for the Blues last season, starting 34 of those matches. But he was not part of Maurizio Sarri’s squad for the first match of the Premier League season as the Italian’s side beat Huddersfield 3-0 on Saturday. 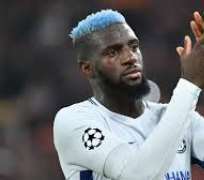 Bakayoko signed for Chelsea from Monaco in July 2017 in a deal worth £40m. This summer the Blues have added midfielders Jorginho – who joined from Sarri’s former club Napoli for £45m – and Mateo Kovacic, a loan signing from Real Madrid. England’s Ruben Loftus-Cheek has also returned to the club after last season’s loan at Crystal Palace. Jorginho, N’Golo Kante and Ross Barkley started in Chelsea’s midfield on Saturday, with Loftus-Cheek replacing Barkley in the 68th minute.